Welcome to the PXI Community. The following tutorial will walk you through process of how to list your products in the community. 1. To begin, you will need to log in or register an account in the NI Community. Do so by selecting the proper link from the Community title bar. 2. After logging in, join the PXI community group by selecting the Join this Group link inside the actions box at the bottom-right section of the PXI community homepage. 3. 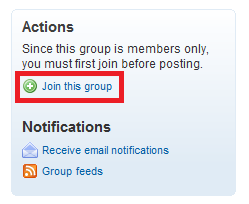 On the following confirmation page, deselect the email notification option and click Join this group. At this point you will now be a member of the PXI community and able to create your product pages. 4. 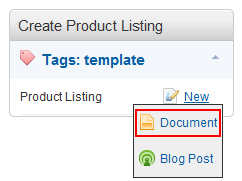 To create a new product listing, select New-->Document from the Create Product Listing box. 5. You will now be presented with a template to enter your specific product information. In the title bar, replace "New Product Listing" with your company and product name. The format should be "Company Name - Product Name"
6. In the document header, replace the the placeholder text with proper company and product information. The web link should be a direct link to the product on your website and not a corporate homepage. Highlight the text you want to link and click the Insert Link icon from the toolbar. Select the camera icon from the toolbar to insert images. 9. Once completed, your page will look similar to the example below. 12. (Important) Expand the Collaboration Options section and select the option for just you to edit the document. Alternatively, you can allow additional users the ability to edit the document. This option is useful if you want to allow others in your company to update the product page. 13. Click the Publish button to finalize the creation of your product page. Your page will be reviewed by the PXI Community administrator and if found appropriate, published to the website.